The 14th World Cup was played in Italy from 8 June to 8 July. A total of 116 national teams had participated in the qualification and 24 would go on to the final phase of the FIFA World Cup including the automatically qualified home team (Italy) and reigning champions (Argentina). Costa Rica, the Republic of Ireland and the United Arab Emirates made their first appearances. Soviet Union was the only other candidate (after England and Greece had withdrawn) when Italy in 1984 was chosen to be World Cup host for the second time. One of the matters that dominated the discussions before the event was the England supporters, among hooligans were included and would be a potential risk factor. If it was a coincidence or not that England’s matches was scheduled to be played at Sardinia remains to be answered, but many felled comforted. A novelty, brought to the game to support a more offensive attitude, was the abolishing of the back pass. Another novelty was a harder ruling against the tackle from behind, which now could directly give a red card. The format consisted of a group phase of six groups (two teams from every group plus four third-placed teams advanced on), followed by a knockout phase. 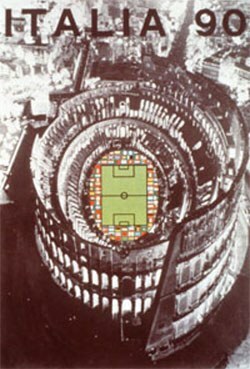 The 1990 World Cup was played at twelve stadiums in twelve Italian cities. 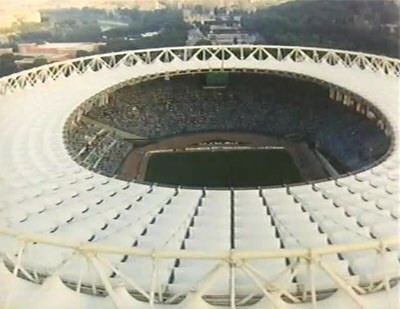 Stadio Olimpico in Rome was the biggest in aspect of capacity and would also be chosen as the venue for the final. The champions from 1986, Argentina, would suffer a chock by losing against Cameroon in the opening match. Argentina managed to advance from the group by the slightest margin and would go on all the way to the final, in two occasions by winning at penalty shootouts (much owing to Sergio Goycochea, a goalkeeper specialized on penalties). Cameroon managed to go on to the Quarter-finals and reach the best result ever for an African team in World Cup football. They were defeated by England in an entertaining game. After their victory against the African sensation, England almost marched on to their second World Cup final, but an unfortunate penalty shootout in the semifinal wretched the dream. It would instead be another final for West Germany, a team led by players like Lothar Matthäus, Jürgen Klinsmann and Andreas Brehme. 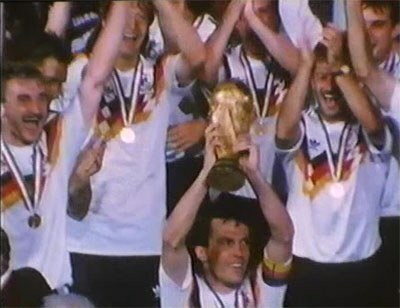 West Germany had impressed more than their final opponents, by winning their group and also by winning one of the tournament’s most unforgettable games. The match between the football titans West Germany and Netherlands would also be remembered for a shameful incident in which Frank Rijkaard spit on Rudi Voller. With Rijkaard sent off and Marco van Basten and Ruud Gullit underperforming, West Germany took a deserved victory. The final was not especially entertaining. Argentina who missed their important striker Claudio Caniggia played defensive and rough. As a result Pedro Monzón and Gustavo Dezotti became the first ever to receive red cards in a World Cup final. The stadium before the final. FIFA World Cup 1990 would include 52 matches in which 115 goals were made. The 2,21 goals per match was a new bottom record. 16 red cards (a new record) and 163 yellow cards were shown during the tournament. Brazil, Argentina, Spain, Yugoslavia, Republic of Ireland, Romania, Italy, Uruguay, Czechoslovakia, Costa Rica, West Germany, Netherlands, Cameroon, Colombia, England and Belgium would advance from the group phase. Argentina, Yugoslavia, Republic of Ireland, Italy, Czechoslovakia, West Germany, Cameroon and England would win their matches in the Round of 16. Argentina, Italy, West Germany and England would win their Quarter-final matches. Argentina would beat Italy and West Germany would beat England in the Semi-finals. Italy would win the match for third place and West Germany would win over Argentina in the final and become the new world champions.